THIRD FORMULA FORD RACE GROUP ADDED! A third Formula Ford race group has been added to the FF50th’s schedule! Please scroll down to News Release #16 for details. The pre-registration window for the FF50th @ Road America is closed. Regular registration will open in early May. Watch this space for an announcement. Formula Ford’s 50th anniversary in North America will be celebrated at the FF50th September 11 – 15, 2019 at Elkhart Lake, Wisconsin’s Road America. 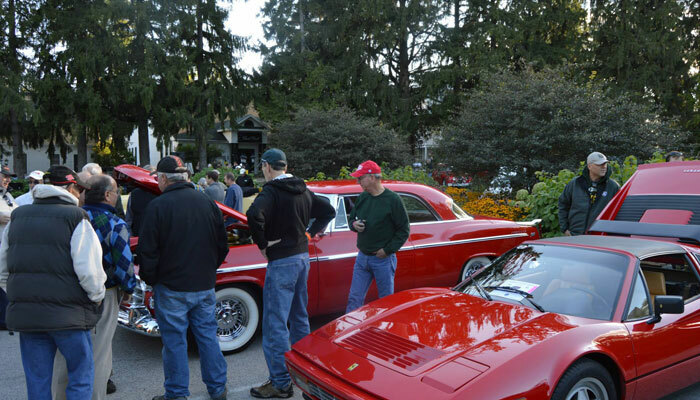 The FF50th will headline the 2019 Elkhart Lake Vintage Festival, the Vintage Sports Car Drivers Association’s (VSCDA) marquee event. Off-track activities will provide multiple opportunities to network, bench race, and get close to hundreds of beautiful cars. The road course re-enactment tours the same public roads (which are now part of the National Historic Register) used for racing in the early 1950s before Road America was constructed. The Gather on the Green is a Concours d’ Elegance competition at the Osthoff Resort in nearby Elkhart Lake. Following the car show is the ELVF banquet also at the Osthoff. Dinner speakers from recent years have included Brian Redman, Vic Elford, and Augie Pabst. Road America is one of the most challenging tests of road racing in North America. The track is located on 640 acres midway between Milwaukee and Green Bay. 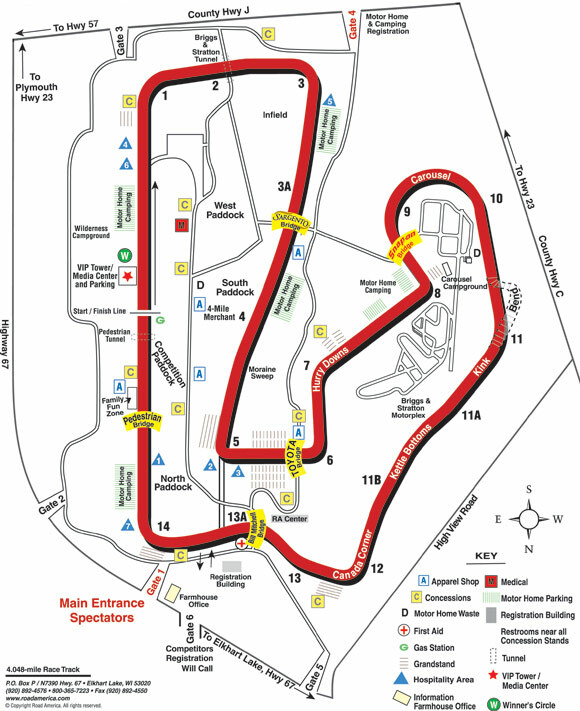 Road America’s 4.048 miles remain in their original configuration from 1955: 14 turns, 150 feet in elevation changes, three long straights, and the iconic Kink. Click on the button below for a lap in a Formula Ford captioned with track notes. To maximize inclusivity (and to prevent administrative chaos), tires will be free at the FF50th. Here it is again in black and white: no tire rules at the FF50th! While your tire selection will not affect the acceptance of your entry, it most likely will affect the race group that you are assigned to. That being the case, it will be best for all involved to run the same tires at the FF50th that you race on at your home track. Transponders. Approved transponders are the AMB / MyLaps TranX260 (original design) and the MyLaps X2 (new design). Minimum Weights. Minimum weights will be 1110 lbs (Kent) and 1060 lbs (Cortina) with driver per the 2015 SCCA GCR. Shock Absorbers. Shocks will be unrestricted for entry but will be a determining factor in group placement and sub-class definition and assignment. Shock info (type, location, external cannisters, etc) will be collected in the entry process. Based on entry composition, these preliminary classifications will likely be further defined and sub-divided in order to fit 200 cars (and multiple race series) into two race groups. Final classifications and provisional race group placements will be announced in January. Ahead of going live, a registration time line (with all key dates) and a checklist (with registration requirements) will be released. Pre-Registration. Pre-registration will be open from November 13, 2018 through January 31, 2019. A $200 refundable deposit towards an expected entry fee of $550 will reserve a spot in the FF50th. Pre-entries will initially be classified into Historic Formula Ford, Club Ford (treads), Formula Ford (treads), Club Ford (slicks), and Formula Ford (slicks). Final classifications and provisional race group placements will be announced in February. During pre-registration, classification and/or race group change requests will be accommodated. Pre-registration deposits are refundable until March 29, 2019. Crossover entries (a driver entering one car in both race groups…two drivers sharing one car is not a crossover) will be tentatively accepted. If there are less than 200 entries on August 12, 2019, crossover entries will be confirmed until both race groups are full. Entries after August 12, 2019 will not bump a confirmed crossover out of a race group. Licensing. Competition licenses issued by the VMC (and its affiliated clubs), SCCA, FIA, and CASC are accepted at VSCDA events. If you are planning on racing at the FF50th on a competition license issued by another organization, please submit a scan of your license with your entry for approval. Calendar year 2018 licenses will be accepted for pre-registration with the good faith understanding that they will be renewed for 2019. Safety Preparation and Annual Tech. The VSCDA Technical Requirements for Race Cars defines safety preparation, logbook, and annual tech requirements for the FF50th. The document outlines straightforward guidelines for basic vehicle and driver safety: on-board fire extinguishers, master switches, fuel cells, roll hoops, driver restraints, helmets, protective garments, throttle springs, rain lights, catch tanks, the usual stuff. Logbooks and annual techs are required at VSCDA events. If your car does not have a logbook, you can obtain one from the VSCDA tech inspection team. Annual techs from other racing organizations (VMC member clubs, SCCA, CASC, etc) will be honored. Car Preparation Sheet. A Car Preparation Sheet must be on file with the VSCDA. The CPS form has been revised for 2019. FF50th Driver & Car Questionnaire. The FF50th entry process includes a questionnaire to collect information that will be used in making race group assignments. This is a new form for this event only. The links to the on-line FF50th pre-registration page and these two .pdf forms will be announced on the go-live date, November 13, 2019. The FF50th has a logo! Designed by Ian Lenhart at Level 11 Creative, the FF50th logo will be incorporated into event decals, tech stickers, advertising, t-shirts, and all manner of memorabilia. Formula Ford’s 50th anniversary (on this side of the pond) will be celebrated September 11-15, 2019 at Road America. 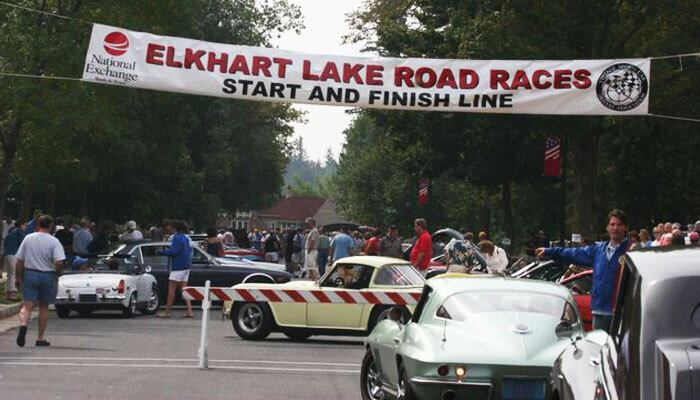 The FF50th will headline the 2019 Elkhart Lake Vintage Festival, the Vintage Sports Car Drivers Association’s marquee event. Open to Kent-powered Formula Fords of all ages, there will be two race groups allowing a total entry of 200 cars. Tire rules (for both slicks and treads) and licensing requirements have been written for maximum inclusivity. The FF50th will be a five-day event starting with registration, tech, and paddock load-in on Wednesday, untimed practice on Thursday, qualifications with a group photo on Friday, and concluding with heat and feature races on Saturday and Sunday. 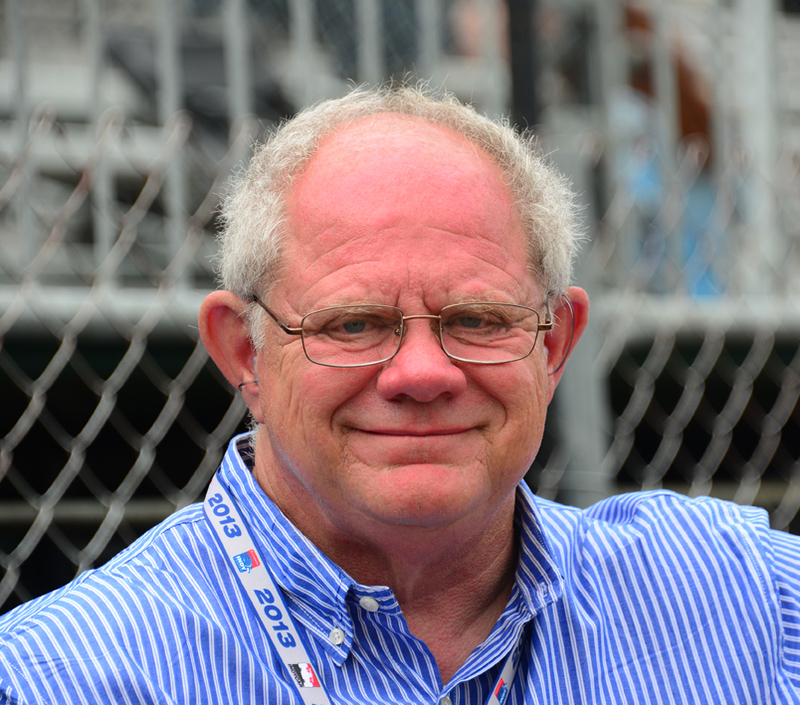 Paul Page, the “voice” of the Indy 500, will be the banquet speaker at the Elkhart Lake Vintage Festival / FF50th banquet Saturday September 14, 2019 at the Osthoff Resort in Elkhart Lake, Wisconsin. Formula Ford’s 50th anniversary in North America will be celebrated at the ELVF, the Vintage Sports Car Drivers Association’s marquee event. FF50th pre-registrations are going to exceed the 200 car limit (2 race groups x 4 mile track x 25 cars per mile). Overflow will be assigned to the VSCDA race group where Formula Fords usually race. That group is going to be very light with a few vintage non-winged FB’s and even fewer FJ’s. An overflow entry will provide access to all off-track events: the Thursday evening meet-and-greet, Friday’s group photo and party, and the Saturday evening banquet. Assignment to overflow comes with a big bonus: first priority into a third Formula Ford only feature race that will close out the weekend on Sunday afternoon. Second entries on cross-overs (one driver and one car entered into both race groups) will be given the option to race in the overflow group space permitting. The overflow plan announced previously is no longer in effect. Entries will be capped at 300 cars. (2) With the third race group, it is now quite likely that second entries on a cross-over (one driver, one car, two race groups) will be confirmed. The priority remains maximizing the number of drivers experiencing the FF50th. Cross-overs will be confirmed starting August 1 and will not be bumped by a late entry. (3) Paddock parking is being assigned in advance. No land rush, racers will be escorted to their paddock locations. (4) About a third of the drivers at the FF50th will be new to Road America. A rookie orientation is being planned. (5) A Formula Ford 50th Reception is being planned for 500+ people Thursday evening right after the untimed practice sessions. It will be a great kick-off to the weekend. The Ford Motor Company will sponsor the VSCDA’s Formula Ford 50th anniversary celebration at Road America. Ford’s corporate support makes a strong statement that interest in and passion for the world’s most popular and populous single-seater racing formula is as healthy today as it was 50 years ago last month when the first “official” Formula Ford race in the U.S. took place. Originally conceived as a car for a British racing school, early Formula Fords featured a durable Ford 4-cylinder passenger car engine. So much fun to drive and so affordable, the class took off well beyond school bounds, first in the UK, then in the US and Canada, Australia and South Africa, and eventually all of Europe. For more than 20 years, a majority of drivers filling the Formula 1, IndyCar and international sports car racing grids had graduated from Formula Ford. Internationally, the long list includes 10 World Champions, among them Emerson Fittipaldi, James Hunt, Ayrton Senna, Nigel Mansell and Michael Schumacher. In IndyCar racing here in the U.S., notables with a FF background include Michael Andretti, Jimmy Vasser, Chip Ganassi, defending Indy 500 winner Will Power and the last two IndyCar champions, Josef Newgarden and Scott Dixon. More than 200 different chassis manufacturers on five continents have built and marketed Formula Fords over the last 50 years, ensuring an ample supply of cars as the class has evolved, becoming today an important staple of vintage racing. And the 1600cc ‘Kent’ Ford engine, although no longer part of Ford’s current car and truck lineup, remains in limited production thanks to the manufacturer’s enthusiasm for this much-heralded class. Several vintage groups in the U.S. will feature Formula Ford in 2019, the class’ 50th anniversary year, but Ford’s involvement is with the flagship — the September 11-15 gathering at Road America in Elkhart Lake, Wisconsin. 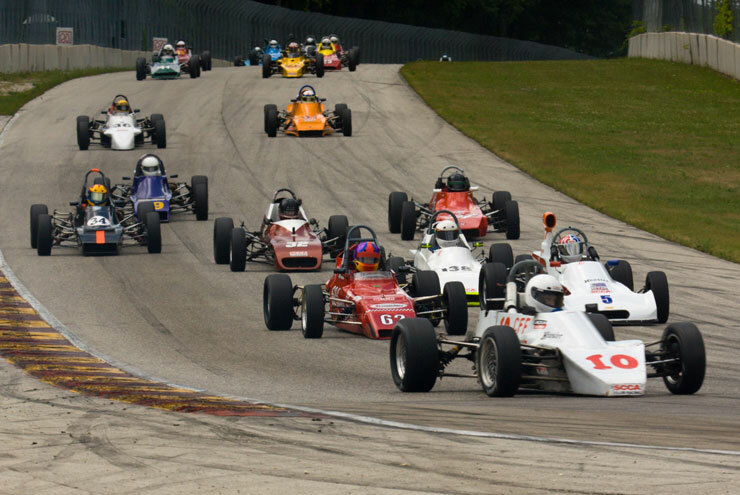 Nearly 300 Formula Fords are expected at the FF50th, the headliner at this year’s VSCDA Elkhart Lake Vintage Festival. For more information on Formula Ford racing, past, present and future, check out the Formula Ford Racer page on Facebook.